Register your child for classes today! Register your child for summer Camps + Classes today! 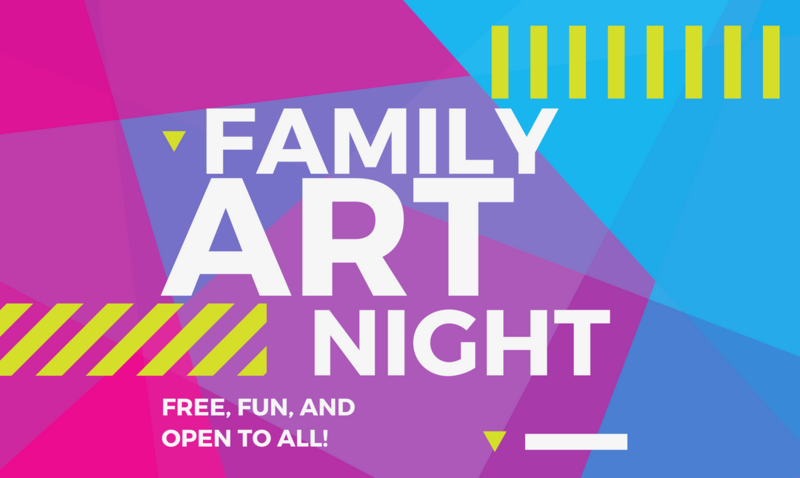 1) DROP IN OR CALL – Call the Library Arts Center office at 603-863-3040 or stop by during gallery hours (Tues-Fri. 11am-4pm, Sat. 10am-2pm) Your registration is complete when we have received your competed registration form, as well as payment for the class. 2) PRINT & MAIL a registration form with your check. Download the FORM HERE. 3) REGISTER ONLINE NOW at the link below. *PLEASE NOTE: If the class of your choice is full or canceled due to lack of enrollment, you will be notified and entitled to a full refund. Class tuition is due in full on or before the first day of the class session. Make-up classes will only be offered when the instructor is unable to teach his/her class. Spring Vacation Art Camp: From Trash to Treasure! This art camp will be packed with projects that are made with recycled materials. 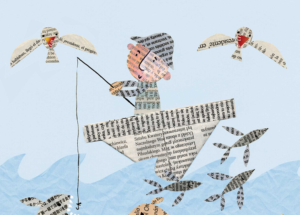 Children will actually make their own paper and use it to create art collages accented by the” junk” mail we have been collecting in the LAC office. We will create 3 dimensional pieces out of newspaper including one- of- a- kind bowls and trivets. We will explore some simple printmaking using hardware nuts and bolts and various gadgets that have been salvaged from the basement! Campers can also plan on a group weaving project as well as mosaic stepping stones if time allows. Instructor Becky Bense really wants to expose campers to all kinds of ways to use ordinary items to create beautiful art! Curiosity, fun and an inventive spirit will lead the way as campers make creative treasure out of what others may have considered “trash” had they looked without an artistic eye. This series is geared toward emerging young artists who want to expand their art skills. Projects featured will focus on 2 dimensional methods of creating including pencil drawing, watercolor painting, collage, and pastels are the materials we will be using. 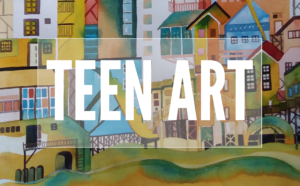 Students should expect to spend a couple of classes on each project as the focus will be on delving deeper into the artistic process to create artwork that depicts growth and development. 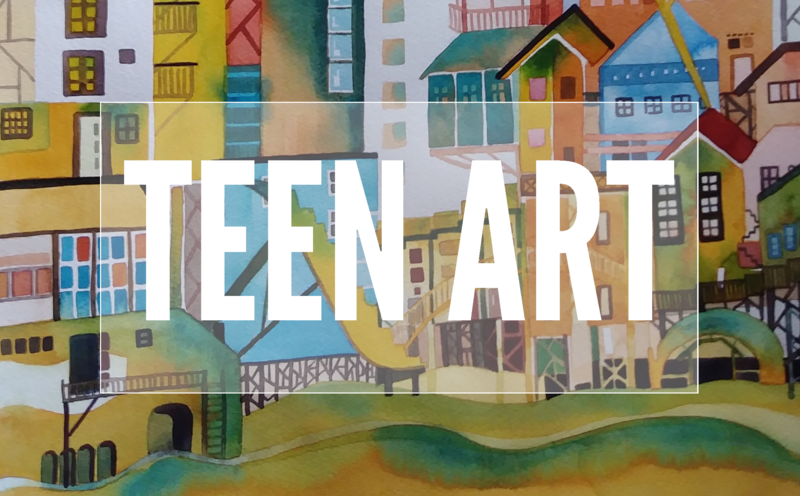 While participants will be immersing themselves in developing their own art skills and styles, they will also be part of a fun and supportive community of other young artists. April classes will focus on FOXES! Tuition $35, sibling discounts available, scholarships available as well; inquire for details. 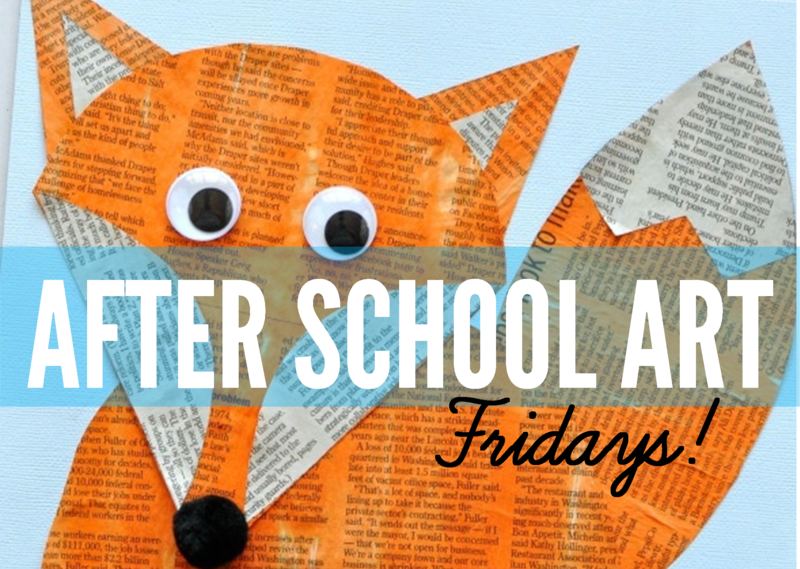 April 5 – Newspaper + Paint Foxes! April 12 – Rock Foxes! April 19 – Fox & Origami Bookmarks! May 3rd– Decorating Fox Cookies! 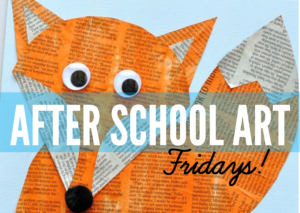 Classes will run every Friday (except April 26th due to Art Camp) through May 31st- Every 4 weeks we will change our theme: April will be the fox, and May, the bear. Please plan to send a NUT-FREE snack -we have aprons but changing into art clothes prior to attending may be prudent! Tuesdays (once a month) 5:30 – 7:30pm — Drop-ins are welcome! May 14 – FANTASY GARDENS! Design your own fantastical plant or a garden for your favorite creatures. Ages: 0 – 5 children with a caregiver (between 6 and 12 children in the class) We recommend signing up for the full session if possible * pre-registration is highly encouraged. For those unable to attend the full session, note that drop-ins are welcome $10 a class for one child and caregiver + $5 for each additional child in that family. 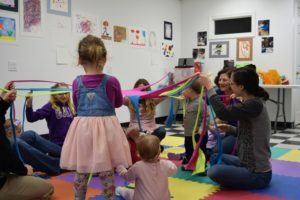 Description: Experience making music with your children & friends in this class designed for young children and their caregivers. Music will come to life as everyone Sings, Dances, Drums & Claps for Fun, experimenting with voices, instruments & movement. (See a full list of class descriptions below table.) *Scholarships are available. more about becoming a MEMBER. Legos go robots in this STEAM camp! Join other young designers to create Milo, the science rover. This LEGO workshop integrates science, engineering, technology, and computing. Participants will work in teams to collaborate and design solutions to challenge problems in a fun environment that sparks curiosity. If you have taken this before, know that Mr. & Mrs. Connell will offer differentiated instruction to meet all participants right where they are to keep the group as engaging and challenging as possible. Learn how to rev up a sewing machine to sew and create your very own, unique sewn project! This art camp will teach participants how to use a sewing machine, from threading and filling bobbins, to cutting out your patterns, piecing and ironing. Get all the basics in this hands- on class. Using these machines will be liberating and safe with the assistants of several seamstress volunteers. Participants will leave with the know-how to use a sewing machine, as well as impressive, completed sewn projects. Sewing machines and all other materials needed for class are provided for use during this class by the Library Arts Center. Colorful wools and felted in to silks to create incredible artful bracelets! Nuno felting is the process of wet felting wool and fabric together. In this workshop you will use this method to merge wool and silk to create a one of a kind wrist cuff. This is a fun project and perfect for beginners, and everyone will leave with a really cool wearable art piece as well as skills to make more! Learn about a master artist, learn to master scissors skills and create your own collage! Come learn about Matisse and the art of collage. 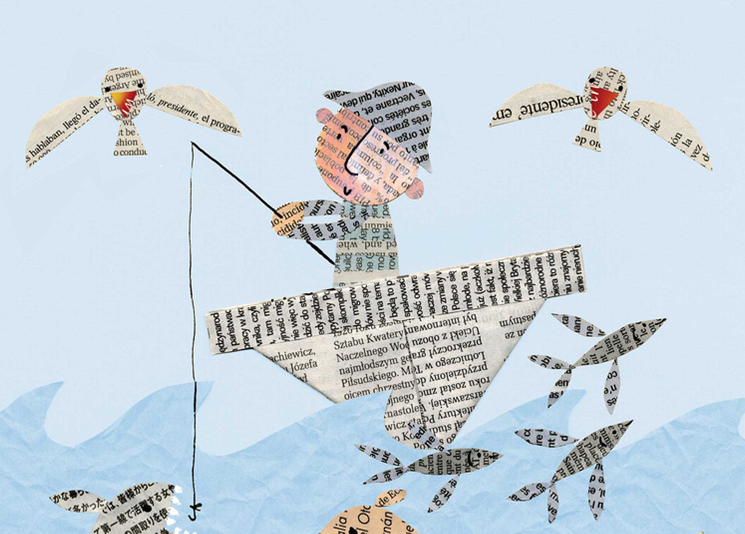 Young artists will use a variety of papers and supplies to cut and glue their masterpieces. Learning to use scissors safely and correctly is an important skill for any young student. In this class, young artists will create and take home a masterpiece that they have cut and glued! Participants will also leave knowing all about Matisse, a master artist. Music will fill the studio as young artists paint to the tunes in the style of this famous artist. Even as a child, Kandinsky loved to paint music, sounds, and emotions through color. After studying works of art by this famous abstract painter, young artists will create their own colorful paintings while listening to a variety of music. Leave with gorgeous abstract paintings as well as an appreciation for music and how it connects to painting. Vibrant paints and silk scarves create artful adornment and a great painting experience. Have the opportunity to hand paint 2 silk scarves using fabric paint. Participants will first paint the background of the scarf and then add stamps for an added layer of design. This is a fun and creative project that’s a fun process, but also ends with beautiful finished wearable art pieces to use yourself, or give as gifts. Build on your sewing skills: Rev Up a sewing machine and sew artistic creations. Rev up a sewing machine to sew and create your very own, unique sewn projects! This art camp will continue to teach participants how to use a sewing machine, from threading and filling bobbins, to cutting out your patterns, piecing and ironing. Become more confident in your sewing abilities in this hands-on class. Sewing machines and all other materials needed for class are provided for use during this class by the Library Arts Center. Create an heirloom quality basket of your choosing in this super fun week long class. In this week long workshop students can choose to make one of a variety of baskets including a wool gathering basket, laundry basket, double-pie, or pack basket (see other options at the link below). The baskets will be woven using reed with a hardwood base, rails, and rim. All materials are created and prepared by Ray Lagasse. Each participant will be asked to choose which basket he or she will be making upon registration. Each Student will leave the workshop with the completed heirloom basket of his or her choosing. Registration will close a week before the class starts. Forest folklore comes to life in this creative exploration of all things from the woods. The spirit and magic of the forest will be the theme of this camp. Learn about green men and women- of ancient folklore. We will be the kings and queens of summer while creating woodland creatures from all kinds of art materials. We will also each create two faces for trees from air dry clay with eyes, nose and mouth, which when attached to a tree will bring the tree to life in the imagination. One face will go home with you to attach to a tree at home, the other will be part of a community art project and will be on a tree in the downtown area for the summer! Join this celebration of all things forest and art! International Volunteers for Peace will be in town this week, so we will have some fun, young helpers from all around the world in this camp, just to add to the excitement. Get more comfortable with a sewing machine and create your own Tote and Pillow Case! Make a pillow case and tote bag with sewing teacher Fran Mirimonti. Patterns and instruction provided for projects. This art camp will teach participants how to use a sewing machine, from threading and filling bobbins, to cutting out your patterns, piecing and ironing. Become more confident in your sewing abilities in this hands-on class. Sewing machines and all other materials needed for class are provided for use during this class by the Library Arts Center. Some sewing experience preferred for participation in this camp. Art projects from around the world with studio helpers from… around the world! This is a multicultural art class based on the countries that our Volunteers for “Bringing the World to Newport” come from. “Bringing the World to Newport is an international Volunteers for Peace program. Newport has hosted volunteers from Italy, Russia, France, Mexico and Germany among other places in the past and looks forward to doing the same this year. Art projects will feature a variety of styles, subjects and media well known from such places. Self-portraits like Italian Renaissance artists, Plein Air Painting from the French Impressionists, abstract painting in the style of Germany’s most colorful and famous painter, Paul Klee and traditional folk art, Palekh (small paintings from Russia), Papel Picado (Mexican paper flags) to name a few. Subjects could change depending on where our volunteers hail from. International Volunteers for Peace will be in the studio this week, so we will have some fun, young helpers from the places focused on for art projects. Bring it to the next level in this art camp for tweens who love art. Learn to take your art skills to the next level! Each session will start with drawing practice as a warm –up before diving into more advanced and new techniques each day in this art camp. Camp will include pencil, conte crayons, watercolors and acrylic paints. Go home with a finished drawing or painting each day, as well as new skills and a lot of creative fun. Counted Cross Stitch for Fun! This classic handcraft gets a fun, modern update and will have you HOOKED this summer. Want to learn a craft that you can easily pick up when you have some free time? Counted cross stitch is the craft for you! During this 2 day workshop you will learn the 4 stitches needed in this art form, how do make your own pattern, find patterns that are free online, and complete a finished project… maybe even more than one. Counted cross stitch projects make great gifts for friends, relatives or to hang on your Christmas tree, and it is a craft that once you learn, you will enjoy for life. Join us for the fun! Art and kindness fill the art studio in this kindness rock painting camp. Come listen to a story with a message that, “it’s okay to be different and it’s okay to be the same, as long as you stay true to who you are.” The story is entitled, Only One You by Linda Kranz. After a brief discussion, artists will choose beach rocks and create garden art that connects with the message of the story. Take these rocks home and place them where they will be beautiful, inspiring messages of kindness to those who happen upon them. By working as a caregiver/child team kids get an early start on the sewing machine and make awesome aprons! Work as a caregiver/child team to create a child’s reversible apron with a pocket on one side, and ribbon ties! Bring two pieces of fabric,1/2 yard each, of coordinating fabrics of your choosing and 2 yards of 3/4” wide ribbon. Children will leave camp with a finished apron and as well as a pattern and instructions for future use. Sewing machines and all other materials needed for class, besides the noted fabric and ribbon, are provided for use during this class by the Library Arts Center. A new twist on this classic craft will have you hand stitching all summer! The craft of making penny rugs dates back to the Civil War when women made rugs and mats from scrap wool fabrics they had around the house. Now, this traditional art is being practiced in all new ways! With the bright, multitude of colors of felt, learn to make great, modern and fun penny rugs. Learn how to make and use patterns, blanket stitch the felt, and create a finished project. We will be making a mug rug, but once you learn the techniques you can make table runners, pillows, wall hangings or anything else your imagination can think up after class! Students will design their own project and complete it within the span of this art camp. Explore this National Park of a historical artists home and gardens and paint on site with two professional artists! This is a true immersive art experience for young artists. Spend a day at celebrated artist Augustus Saint Gaudens historical summer home enjoying the grounds, the sculpture studio and the view of Mt. Ascutney. This historical landmark is so important that it has been designated a National Park! Artists and arts instructors Deb Campbell and Patti Warren will demonstrate how to paint a landscape and provide a guided lesson for participants. Materials provided. Time will also allow for some exploration as a group of this enchanted property, including sculpture gardens, winding paths, open, rolling fields for lawn and nestled in art studios. Parents can either enjoy their own self-guided tour of the property while your children are painting and exploring, or you can drop off your camper at the gate and return for pickup later in the day.